RAWALPINDI: Pakistan tri-services military band enthralled audience by their spectacular performance at Cape Town, South Africa on the eve of 10th annual Cape Town Military Tattoo held from 10 to 14 November 2015. According to Inter Services Public Relations (ISPR), the focus of the prestigious event this year, was commemorating world war I and honouring the soldiers who served in the War. All military bands from tri-services of South African Defence Forces were part of the tattoo. Pakistan tri services band played ceremonial and marching tunes including the national anthem and patriotic songs. 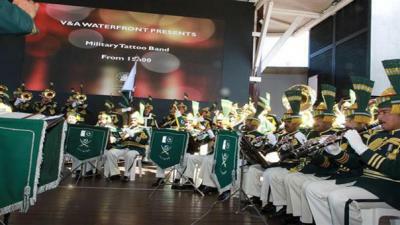 The band besides performing at the tattoo also gave a public performance at Victoria and Alferd Waterfront. The public and officials of South African Defence forces acknowledged and admired Pakistan military's band performance. Owing to the festival, military musicians figure as the ambassadors of peace and mutual respect between people representing the diversity of national artistic and military traditions.